The SURFACE SKIMMER MANTA is a near-neutral buoyancy glide bait that is designed to run just below the surface. You can also make it bulge in the surface film, creating a wake that fish can’t resist. Its revolutionary, patented design allows YOU to determine what speed and cadence to fish with. You can also control the length of its side-to-side glide action, which allows you to literally work the bait further to the right or left, so you can work around obstacles such as weeds or downed timber. Its forgiving design allows you to change your rhythm to help eliminate follows and stimulate more strikes. It is 8”and 2.9 ounces of super-tough, virtually indestructible, solid, plastic that casts like a bullet and works like a dream. You’ll soon find that it will be the most forgiving and workable glide bait that you’ve ever used. How to “WORK” the SURFACE SKIMMER MANTA….. The SURFACE SKIMMER MANTA may be worked slowly or quickly, HOWEVER one simple rule must be followed: Face the lure and make short, rhythmic, downward twitches (12 inches or less as a ballpark figure). That is all that is necessary to make the lure operate properly. DO NOT MAKE LARGE SWEEPS WITH YOUR ROD! Please keep in mind that very little effort is required to use the lure effectively. Mix up your timing in order to make the SURFACE SKIMMER MANTA’s underwater “walk the dog” action more erratic. Throw in hard twitches here and there during your retrieve to make the lure dart further to one side, and then pause the lure and let it suspend for an instant. 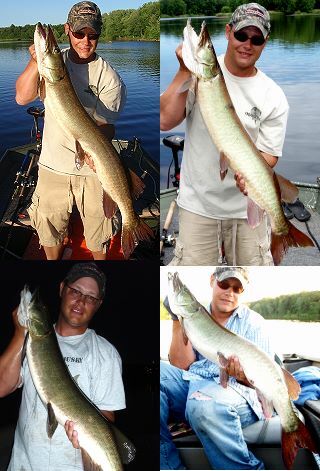 Muskies generally hit this lure broadside just as it pauses. BE READY, because you generally do not see follows with this lure. 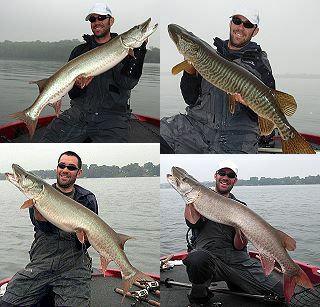 Carry bolt cutters, since 4X hooks are very hard to cut, and we have found that many muskies are hooked very solidly. Last but not least, FOR PROPER LURE OPERATION, ALWAYS HAVE TWO IDENTICAL HOOKS ON YOUR SURFACE SKIMMER MANTA.